2. An Old Part of Lewes ? Frances is a former curator of Cuckfield Museum and well known adult education lecturer. As an art historian, FS became interested in the story of suffrage campaigning in Sussex through researching her book, ‘Robert Bevan, from Gauguin to Camden Town’ (Unicorn Press 2008). Her subsequent publication, ‘Mid Sussex Suffragists’, tells the story of the artist’s younger sister, Edith Bevan, who founded the Cuckfield and Central Sussex Women’s Suffrage Society. Since moving to Lewes two years ago, Frances has been researching the local campaign for women’s suffrage during the years leading up to the Great War, and the reaction it provoked, in the Lewes area. You will meet what may well be some familiar names, but in a rather different context. 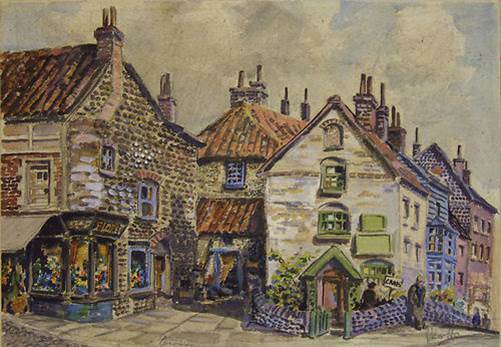 This watercolour signed in pencil, bottom right ‘J N Rignall, 1951’ and titled “An Old Part of Lewes” was offered on ebay recently. I am probably being obtuse, but I don’t recognise it. Does anyone? I am updating my knowledge of the history of the railways of Lewes preparatory to giving a talk on the subject at the Linklater Pavilion on March 31st. I now live at some distance from Lewes, so I am writing to ask if there is anyone who would be so kind as to do a small piece of research for me. I understand that Leighside, the home of Burwood Godlee who had so much to do with the development of the local railways, was occupied by his widow until the early years of the 20th century. It is my understanding that the Leighside Estate was then sold to the railway company. Originally I thought that the house stood empty between Mrs Godlee’s death and its demolition in about 1938. I now have reason to believe that it was occupied, and John Kay has in fact found out for me that it was in use by a firm of nurserymen called Pilbean & Uridge in the late 1920s. I would be most grateful if anyone could find and tell me about any other references to Leighside in Kelly’s or other directories for the early part of the 20th century. I would particularly like to know what is the latest directory in which Mrs Godlee is referred to, and any other references to Leighside and its occupants. [Ian McClelland has responded to this last query]. The first report of the Borough of Lewes Post-War Development and Housing Committee, published in June 1944, recommended that the purchase of Southover Grange and its gardens should be a priority. 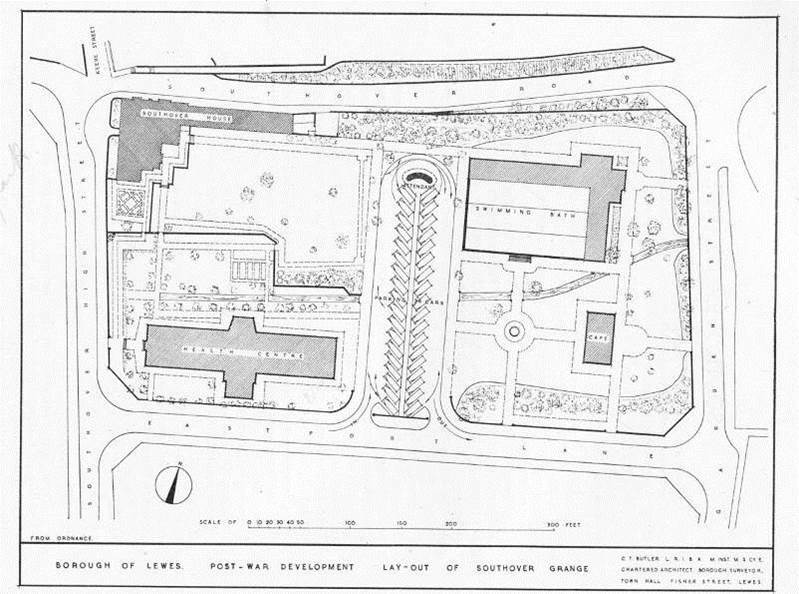 They valued its central site and feared it might fall into the hands of speculative developers – this was before the 1947 Town & Country Planning Act gave local authorities a measure of control over planning and introduced the concept of the listed building. An option to buy was negotiated with the owner, farmer and property owner Harrie Stacey. The Grange itself had been requisitioned by the military during the war, and was doubtless not in peak condition. The committee was chaired by Councillor Hubert C. Woolmore, and its other members were Aldermen William J. Hoyles and Arthur W. Farndell, and Councillors Samuel Baker, Charles J. Geering and Hereward E. Parrish. They were not a committee of conservationists but they did plan to retain the historic Grange itself. However, their plans for the gardens included a 36-car car park, accessed from Eastport Lane, with its own attendant’s booth; a new swimming baths for the town; a cafe; and a health centre. They prepared a detailed layout, below, for inclusion in their report. At the very start of the war the government became concerned, rightly as it turned out, that enemy action might result in the destruction of much of Britain’s heritage. They therefore commissioned a group of war artists to travel round the more vulnerable areas and record for posterity some of its characteristic historic buildings for its ‘Recording Britain’ series. The idea, the brainchild of Sir Kenneth Clark, resulted in more than 1,500 pictures. The war artist Charles Knight visited Lewes and drew Southover Grange as part of this series. 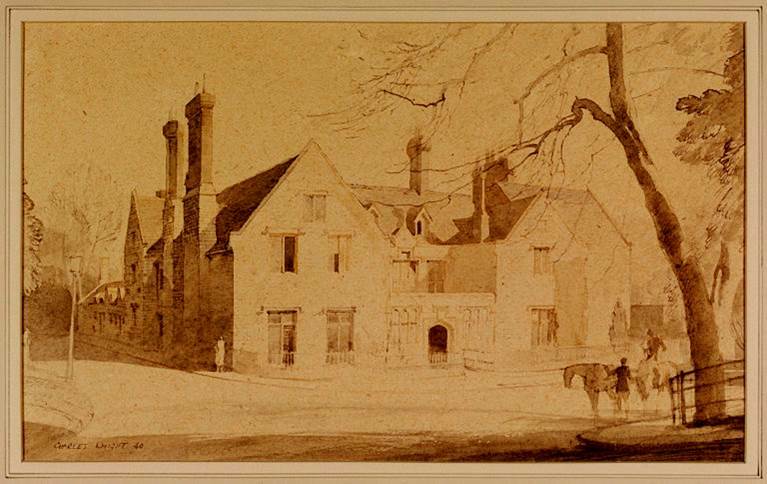 His pen and wash drawing [see below] survives in the Victoria & Albert Museum, catalogue number E2348-1949. While wandering round your beautiful town on a recent visit, I noticed some odd markings on the pavement. They are grave-shaped slabs bearing the letters CM and what looks like a spear in the middle. Does anyone know what these are? Carolyne can be contacted at anniemk5@gmail.com. The Lewes History Group has now become a formal organisation, with a membership list, so from April onwards this Bulletin will be distributed only to members. We will, however, continue to circulate details of events to everyone on the current email list. If you are not yet a member, but would like to become one, please sign up at one of our next two meetings, or send a cheque made out to “Lewes History Group” to our membership secretary, Neil Merchant. Please contact Neil for his address. Membership is £8 p.a. for the first member at each address and £4 p.a. for additional members at the same address. This entry was posted in Cultural History, Lewes, Local History, Social History, Transport History, Urban Studies. Bookmark the permalink.